For better pre-conditioning of the withered leaf, for quality control and for optimization of the CTC output. Constant mechanized feed to the Rotorvane and subsequently to the cutting rollers. Efficiently separates unwanted foreign materials and dust particles from the withered leaf before it goes for processing in the Rotorvane. Also separates any metal particles that could pass through with the help of a powerful magnet bar fitted across the width of it. Zenith's Green Leaf Shifter has stainless steel body with steel framework. Special fibre glass spring flats provide support to the feeding bay. The machine is driven with the help of a heavy duty eccentric crank shaft and drive mechanism which propels the leaf forward. 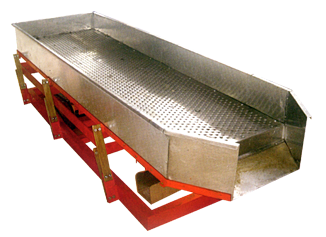 To counter the eccentric movement of the feeding tray and to minimize the vibration, another tray is provide to balance the weight of the of the feeding tray. A 1500 gauss powerful magnet bar is properly positioned and fitted to attract metal particles.A discharge lever is provided which controls the discharge of the withered leaf into the Rotorvane. Note: Due to continuous process of development the design is subject to change without notice.